Illinois Has Second Highest Property Taxes - How Are They Calculated? Illinois homeowners pay the second-highest property taxes in the nation according to real estate data company Attom Data Solutions. Most people will tell you they think their taxes are too high, and now you have the confirmation. Only residents of New Jersey pay higher property taxes than Illinois, with Vermont, Texas, and New Hampshire not far behind. Of course, property taxes are essential to maintaining government services such as public schools, water lines, sewers, roads, infrastructure, parks, and libraries. It’s not out of line though to wonder if they’are worth it. 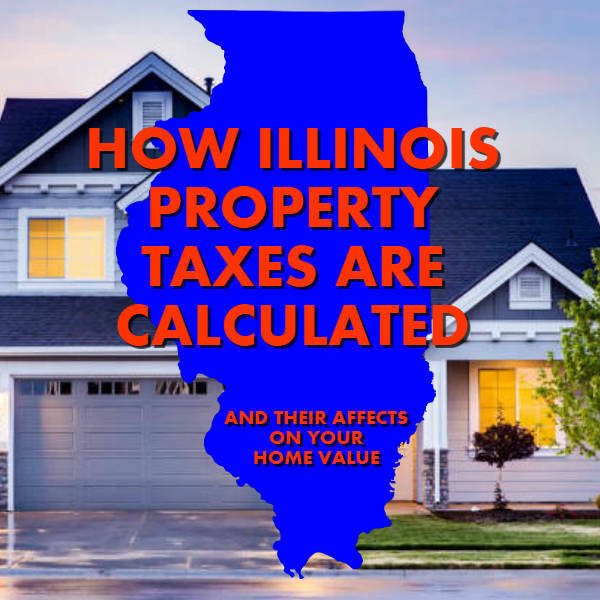 In this post, we discuss how property taxes affect your return on home ownership and how property taxes are calculated in the state of Illinois. The method of calculation may surprise you. Your property taxes affect home values and take away money that you could potentially spend on home improvements, paying off your mortgage sooner and building equity. Property taxes are the second-highest cost of homeownership after your mortgage. They are a key indicator of profitability for real estate investors. Home appreciation prices are held in check by property taxes. This can be both a benefit or a hindrance. In high-tax states, home prices don’t rise as quickly during a housing boom because people have to pay for those higher values through taxes. On the potential upside, those same markets are somewhat more protected from wild price swings. Most people assume that property taxes are based on the assessment of properties. Your property tax bill actually starts with how much the county, municipality, and taxing districts (school district, park district, library district, etc.) expect to spend. The various taxing bodies figure out their budget based on the prior year’s budget plus an annual increase. They then figure out home much money they can expect from the state, assess the current taxable value of the property in the districts, and then the county clerk figures out the tax rate. The county clerk calculates the tax rate based on the amount that the taxing districts are allowed to receive reconciled with the assessed property value. In other words, taxes are based on how much they expect to spend, based on what they can get. This can be very confusing because it is the opposite of how income taxes work. With income taxes, the more you make, the more you pay. But when your property value goes down, it doesn’t mean your property taxes go down. If you think you are paying too much in taxes because your own property is not worth as much as the assessor thinks it is, you need to protest the specific assessment. You will need to provide evidence that your property is not worth as much as the assessor thinks it is. This may include property sizes, home upgrades, location, and other factors. There is also a time limit as to when you can contest your assessment. For example, in DuPage County, the period during which an appeal may be filed ends thirty days after the publication of the township assessment roll. This publication date varies, but in DuPage County, it is usually in October. Most states figure property taxes based on local budgets and assessed values, which translate to a tax rate. It can’t be that easy in Illinois though. Illinois complicates the tax calculation by applying an “equalization” factor that figures the final tax rate up or down. Municipalities have the right to accept or reject the equalization factor, which further complicates the issue. When appealing your property tax bill, you must take into consideration how your own bill was assessed based on the equalization factor. If you successfully appeal your assessment, your bill might not go down by much, or not at all, depending on how your municipality uses the equalizer. Understanding this system will help you to vote and comment with an informed opinion about how the system can be improved for everyone.